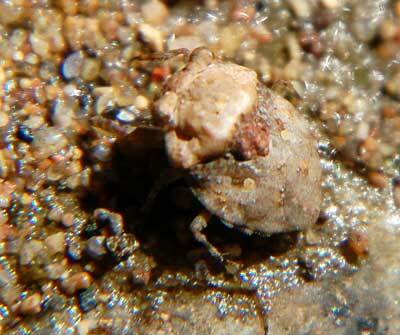 This toad bug is about 8 mm long and was found hopping and feeding on damp sand at the edge of a drying pool of water near Mesquite Wash, Maricopa Co., Arizona, 01 Aug. 2009. Toad bugs when viewed up close are amazing to see. Their resemblance in miniature to amphibious toads is spectacular. Large eyes for spotting prey and predators. Saltorial hind legs able to quickly launch the bug away from danger. And a mottled pattern and coloration permitting superb camouflage when in sit-and-wait hunter mode. With piercing-sucking mouthparts ready, toad bugs pounce onto their prey and stab them. After digesting and withdrawing the preys contents, the empty skeleton is left.